The first two years of life are a complete miracle as your baby unfurls from the foetal position, learns to roll over, sit, crawl, stand, walk and shift from babbling to saying their first few words as a toddler. Toys, beyond teethers, rattles, cot and pram accessories, become more important from the time your little one can sit. Their concentration span is very short which is why colourful, action-reaction toys with sounds keep them focused for longer. You most definitely need to be in the play equation to keep your child’s concentration going. They do not play alone at this stage and need constant verbal and physical feedback from you. Fascination toys work well, and so do ‘put it in/take it out’ toys. Discovering where the ball/shape has gone never ceases to amaze them. Everything 0 – 2 year olds do is a new adventure. Encourage movement and exploration of their physical environment rather than handing them an electronic screen or device every five minutes to keep them quiet and occupied. 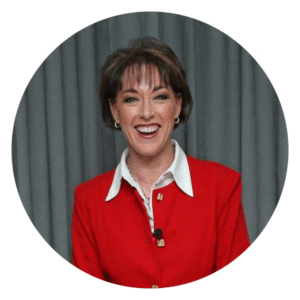 Talk a lot while you are playing together – this is how you build word power. Every single experience is shaping their young brains and laying down foundations for later learning, and don’t forget that they still need lots of sleep to process all this stimulation. We’ve hand-selected 10 of our favourite hot toys and games in the 0 – 2 age group for you. They are tried and tested, and where possible, we have chosen items that are multipurpose or will grow with your child. Stack the five brightly coloured, textured rings on the elephant’s trunk. As each ring is placed on the trunk, he will play silly sounds, say adorable phrases and introduce colours, numbers and shapes. Press the music note button on the end of the elephant’s trunk to hear playful songs. Press his tail and the elephant will count and talk, sneeze and send the rings tumbling off his trunk. Then, play again while learning all about colours, numbers, shapes, and using fine and gross motor skills in the hands and arms. An unusual set of textured shapes (24, 36 or 48 pieces) for sensory stimulation. Pop, click or screw the colourful halves together and take them apart. Mix and match the different textures and colours for creative fun. Use the accompanying threader for another way to link the shapes. 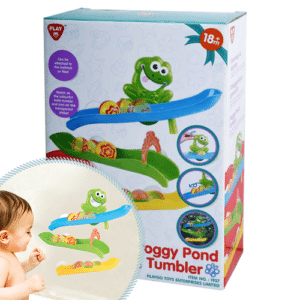 Perfect for water and dough play too. Your little one will have fun developing their fine motor and matching skills. Get years of use out of this product. Enjoy this new spin on learning shapes, colours and numbers. 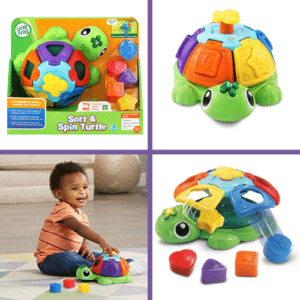 Match the shapes to the turtle’s shell then press the butterfly button and watch all the shapes spin and fly out all over the show while hearing music and learning rhymes. Press the light up flower button on top of the turtle’s head to play three learning songs. Eye-hand co-ordination and matching skills will be mastered with this game. Shape matching creates foundations for reading and writing. Bath time is multisensory fun time where we can continue to engage our little ones’ curiosity about how the world works. Suction the tracks on the side of the bath (these are particularly powerful ones) and you have a froggy marble run! The balls race down the slides and splash into the bath. Your child will want to do it again and again for the surprise factor. They are learning about cause and effect and problem solving. Turn the froggy to release the balls and watch them roll down the track. A talking cement truck that does colour tricks! The three balls are beautifully textured for sensory feedback and when pushed into the posting hole in the truck there is good resistance which means a bit of pressure must be applied. Your child will learn about colours, shapes and numbers. Has five learning songs and 15 sound effects. 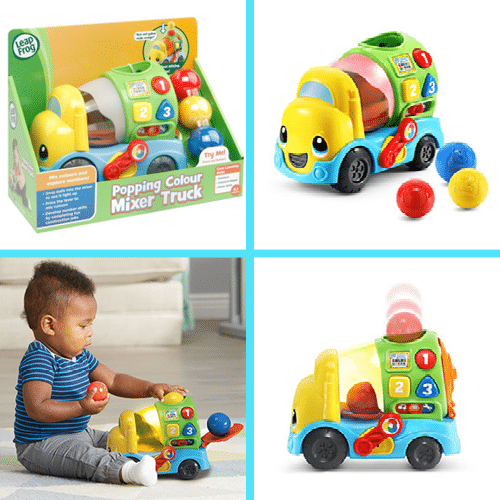 Goes from basic to mixing things up, depending on which button you press, to make playtime more challenging. Lots of cause and effect. 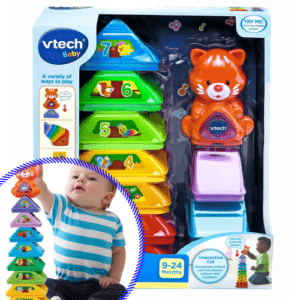 Stack, sort and store with this very clever talking toy. The cat will say different things depending on the stacking triangle it is attached to – a very intelligent cat indeed! Place the cat on top of each piece to learn colours, numbers and animals while developing fine motor skills. Press the big light up button on the cat to hear fun sounds and music. 15 melodies and four sing along songs. 10 coloured pieces. Sort the pieces into colour groups and place them in size order or number order. All important perceptual skills for your child to learn through this solid construction toy with an electronic interactive twist. 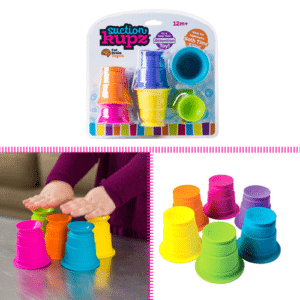 Stack, roll, stick, sip and pour with these six brightly coloured, high quality squishy cups, The base of each cup suctions onto any smooth surface or even to the base of each other. Use in the bath for scooping, pouring and floating. Stick them to windows, baths, walls, windows, the fridge door, counter tops, tables, and floors for whatever creative endeavours your child’s imagination can conjure up. They will stimulate fine motor skills, proprioception, spatial reasoning, creativity, exploration and experimentation through open-ended play experiences. Made of 100% food safe silicone that’s also dishwasher safe. We love a 2 in 1 product. 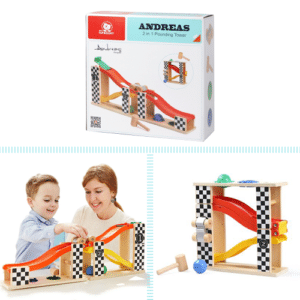 Use it as a hammer ball pounding bench and then open it up and it becomes a racing track for both the wooden car and the balls. Holding a hammer stimulates fine motor co-ordination and actual hammering of the balls is a gross motor activity that exercises the entire arm and shoulder girdle. All these movements will both entertain and develop the neurological pathways for writing one day. This is a very sturdy, classic wooden toy. 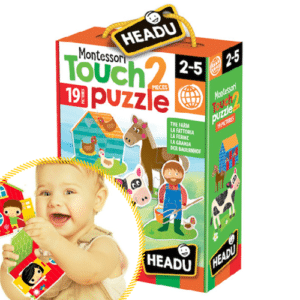 19 x two-piece puzzles made with special textured surfaces to stimulate your child’s sense of touch and keep them fascinated. Each puzzle is self-correcting. Your child will learn matching and spatial planning skills as they manipulate the pieces in the right direction to find a perfect match. Once built, parents and children can tell stories using all the characters to extend the play. Puzzle building in real life is very different to doing it on device. Comes in different themes: park, farm and sea. A grow with me activity for the toddling child. 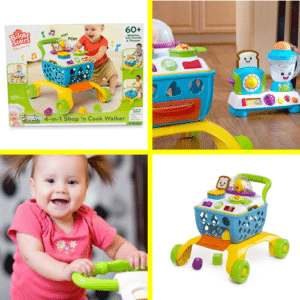 The 4 in 1 walker enables the cook/stove top to be removed for sit and play. The cart legs lock in place so the cook top becomes a stationery activity table for the standing child. When baby begins to toddle the wide-sturdy legs are perfect for learning to walk while pushing the trolley. As they do so the popcorn pops rewarding them for their efforts. Remove the cook top to reveal a shopping trolley for toddler fantasy play and it’s also a shape sorter! We love the sizzling sounds from cook top, the popping popcorn and the sandwich that pops up by sliding a lever. 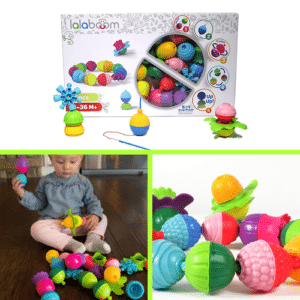 A lovely multi-purpose action reaction toy that is great value for money.